Canadian Pacific's third Empress of Britain was built by Fairfield Shipbuilding and Engineering of Glasgow. 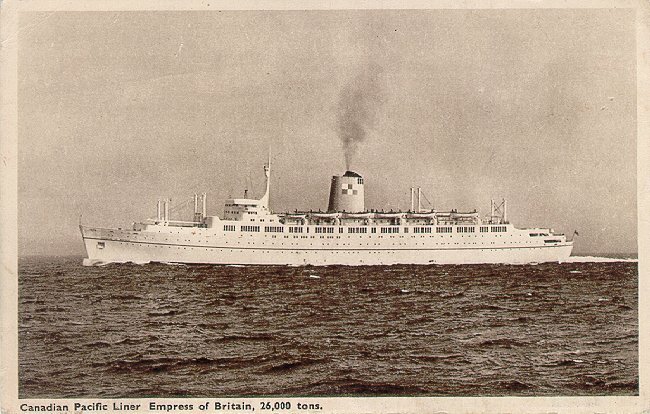 Launched by Queen Elizabeth II in 1955, she and her sister Empress of England were reportedly the first North Atlantic liners to be completely air-conditioned. Her maiden voyage, on 20 April 1956, was on Canadian Pacific's Liverpool-Montréal service. The ship's Canadian Pacific service was short-lived, however, as the age of transatlantic ocean travel was rapidly coming to an end. She made her final Liverpool-Montréal trip on 3 September 1963 and was then chartered to Travel Savings Association for cruising. In November 1964 she was sold to Transoceanic Navigation Corp., a Greek Line company. Renamed Queen Anna Maria, she was placed on a Piraeus-New York route and later also served Haifa-New York. The ship was again sold in 1975, this time to Carnival Cruise Lines, and renamed Carnivale. She became the FiestaMarina in 1993, and is still in service as of April 2000 as Epirotiki Cruises' Olympic.